It can be quite expensive when you bring the whole family to a steakhouse for dinner. Today’s secret recipe will help you save a few bucks by making LongHorn Steakhouse’s grilled herb-rubbed beef tenderloin at home. This tenderloin is seasoned with LongHorn’s signature herb rub, grilled to perfection and then topped with a rich portabella cream sauce. 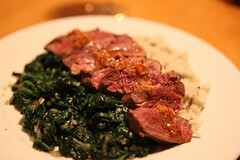 To complete this meal, serve the tenderloin with these recipes for garlic sauteed spinach and creamy mashed potatoes. Have your butcher trim and discard the excess fat and silver skin from the tenderloin. Lay the tenderloin out with the smoothest side up. To ensure a consistent thickness on the grill, fold the tail end of the tenderloin under itself to form an even thickness. Tie the tenderloin snugly with butcher’s twine at 2-inch intervals and secure the folded end with two strings. Lightly coat the roast with oil. Season the roast all over with the herb rub. Brush the cooking grates clean. Sear the tenderloin over the hot side for about 20 minutes, turning a quarter turn once every 4-5 minutes. Then slide the roast over to the warm side, loosely cover it with foil and cook until it reaches your desired doneness, 20 to 30 minutes for medium rare (125° to 130°F), turning once. Remove from the grill, loosely tent with foil, and let rest for 10 minutes. The temperature will rise 5 to 10 degrees during this time. Snip and remove all the twine from the roast. Cut the meat crosswise into 1/2- to 1-inch slices and arrange onto a serving platter. Garnish with fresh rosemary sprigs and serve warm with the sauce. To prepare the cream sauce, melt the butter in a saute pan. Add the portabella mushrooms and saute for 3 minutes. Add the white wine, soy sauce, salt, pepper, garlic powder and cayenne pepper. Add heavy cream and stir to combine. After 2 minutes add the chives. 2) Discover The Secrets Of Making Popular Sushi Dishes. 3) Meals That Taste Even Better Than Top-Notch Restaurants!